Electronic data capture (EDC), described in Section 4.6.3 above, can streamline the patient screening and recruitment processes and allow for central statistical monitoring (Kramer & Schulman, 2011). 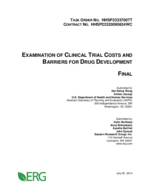 While is it likely that adoption of EDC would impact many aspects of clinical trials, including site monitoring timelines and costs; site management and project management timelines; and data collection, management, and analysis costs, we only found information in the literature pertaining to the impact of EDC use on study duration and total costs. A 2010 paper reported that use of EDC resulted in a 30 percent decline in study duration (Neuer, Warnock, & Slezinger, 2010). Another study reported that use of EDC reduced total trial costs by 9.8 percent (Eisenstein, et al., 2008); however, we chose to model this approach using impacts on itemized parameters in order to allow for greater flexibility. As with some of the barrier mitigation strategies discussed above, it is necessary to adjust the 30 percent reduction in study duration by the baseline adoption rate. To do this, we used an adoption rate of 50 percent reported in the same paper: “By the end of 2007, nearly half of all new Phase 1 – 3 studies will be initiated using EDC” (Neuer, Warnock, & Slezinger, 2010). Again, this 2007 adoption rate was used instead of a more recent one because it more accurately reflects the average adoption rate across the entire time period covered by the cost data from Medidata. Thus, if we model this using the 30 percent decrease in study duration and assume an adoption rate of 50 percent, the effect is a 17.6 percent decrease in study duration in Phases 1, 2, 3, and 4. Table 8 presents the costs savings estimates for this barrier mitigation strategy. Main cost savings for this strategy occur in Phase 2, 3 and 4 studies with savings ranging from $0.5 million (cardiovascular) to $6.7 million (respiratory system). In Phase 1, the highest savings are $0.4 million (immunomodulation and respiratory system). The savings range from $0.5 million (cardiovascular) to $2.4 million (hematology) studies in Phase 2. In Phase 3, the highest savings that can be expected from the adoption of mobile technologies is $6.1 million (pain and anesthesia). Finally, the range of savings in Phase 4 studies is $0.7 million (genitourinary system) and $6.7 million (respiratory system).